LTE LAUNCH: Digicel’s Technical Director Chandrika Samaroo answers questions during the launch of the company’s LTE network at Digicel Imax in One Woodbrook Place. Also in photo are Director (Legal) Desha Cliffor and Chief Financial Officer Trevor North, right. 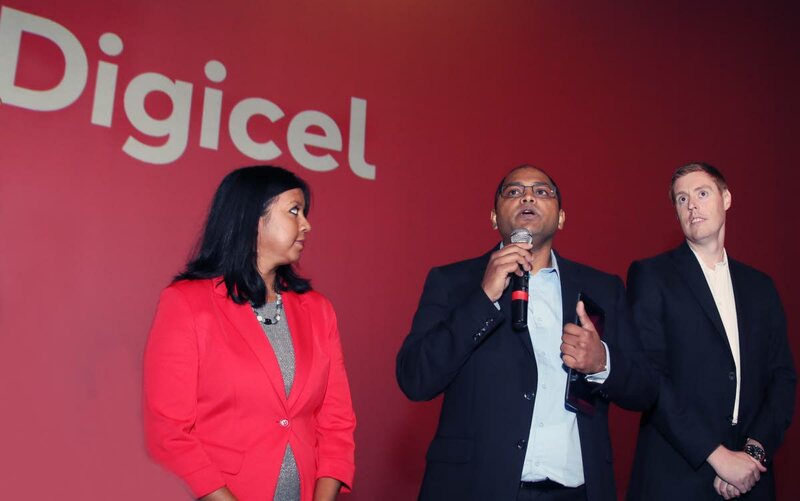 DIGICEL TT rolled out its latest network LTE (Long Term Evolution) in fine style before the media and management of the organisation at Digicel Imax in One Woodbrook Place yesterday. A short Digicel TT video speaking of the limitless possibilities that LTE can offer, stated: “We’ve come a long way to get to this point. Even though your call quality wasn’t great in the process because we’ve been installing tons of new equipment, but we fine-tuned our network to deliver LTE to you. This means that customers will now enjoy glitch-free video streaming of their favourite online content on their smartphones or tablets, while using interactive apps at home or on-the-go. It was also indicated that customers in north-west, east and central Trinidad, as well as east Tobago with LTE SIMs and is LTE compatible can enjoy the benefits of LTE. However customers in south Trinidad and west Tobago will have to wait till the end of the year to enjoy the service. Customers can also use Digicel’s LTE Checker at www.digicelgroup.com/tt to find out if their devices are supported by Digicel’s network, or else they can go to any of its stores and get an LTE Sim. Digicel’s Penny Gomez, noting her company’s association with the culture of this country, invited guests to witness a dance featuring Andre and Rene Arneaud, who are expected to compete in the US-based World of Dance competition, in Los Angeles, USA later this month. She said they will be doing so with the support of Digicel. Chandrika Samaroo, technical director, Digicel TT then shed more light on what the new LTE network is all about. He proudly said: “Welcome to Digicel’s LTE world of speed mobility and coverage. He said in 2017, Digicel’s 2030 transformation programme was introduced with one of the pillars being to provide an amazing network experience for customers. As Digicel moves to broaden internet connectivity across TT they will soon provide an island-wide LTE network. As an introductory offer to new users joining the LTE network, they get 25 percent off for three months and a switch to Digicel’s LTE Network can get 25 per cent off for six months. There is also a d’Music app where over 30 million songs can be downloaded on one’s phone, tablet or PC, quick pick bundles and unlimited bundles with several features. Reply to "Digicel rolls out LTE network"